Kortet skulle være i farverne sort, hvid + en anden farve. Beautiful card, lovely layout and sweet image. Thank you for joining us this week at SSC and good luck. Awww this card is so sweet. Thanks for playing this week. Love this cute little image and all the sparkle makes the card even more wonderful! Thanks for playing along with us week! Hope you'll join us for some more challenge fun soon! Thanks for playing with us this week! See you next week! What an adorable card...love the image and the little ticket on the bottom corner! 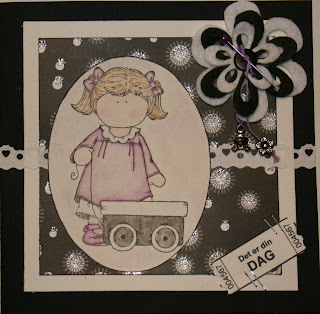 Thanks for joining us this week at the Stamptacular Sunday Challenge! Such a sweet image and a great layout. Thanks for joining us at SSC. For et nydelig kort med flotte detaljer og layout! Blomsten er virkelig lekker! Takk for at du deltar i utfordringen hos SSC denne uke og velkommen igjen!